This apartment is an experiment. A test if you will. The purpose is to streamline the circulation of the spaces as we use them. 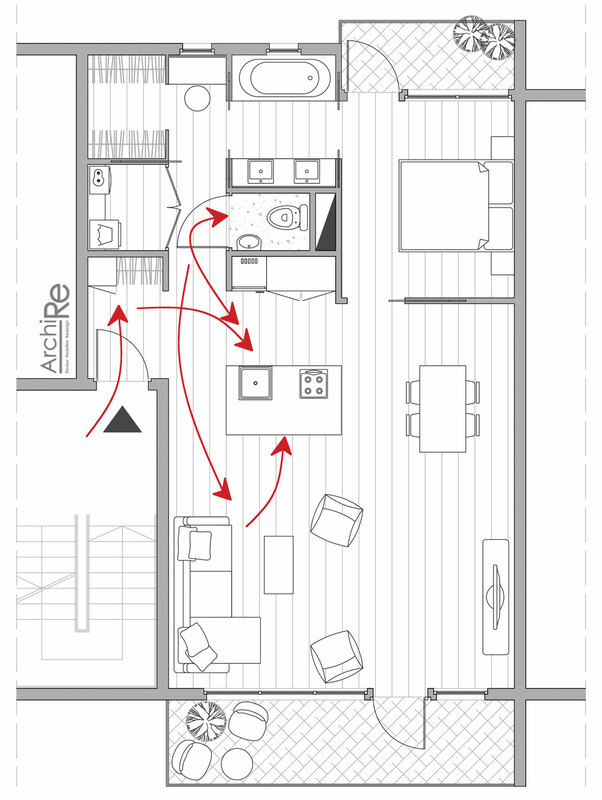 Bedroom to toilet/bathroom, kitchen to closet, living room to kitchen, kitchen to bedroom. How many of us actually use the rooms in our house one by one and then be done with it? We tend to go from room to room, over and over again based on needs, on memory, personality, events, mood and so much more. We’re in a constant flux. 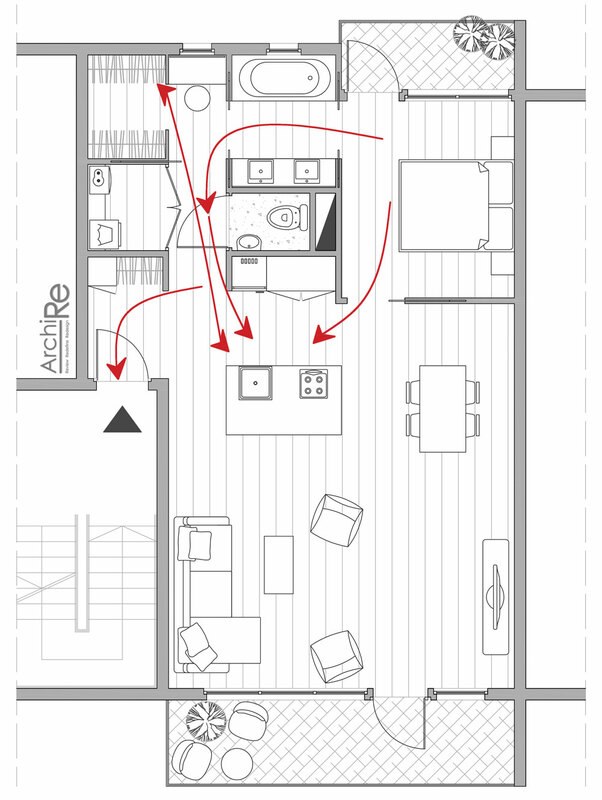 The most “isolated” spaces, sort of end points, were we tend to spend more time, are the bedroom and the living room. Those are pit stops. Everything else is part of the motion. What is the first thing you do upon waking up? Most people go to the toilet and then search for the closest mirror. Then they crawl their way to the kitchen to make coffee. Once their eyes are fully open they either shower and get dressed or make breakfast. Few people don’t backtrack through their space. Change of mind, change the blouse, forgot the bag, where is the shoe, back and fourth through bathroom, closet, toilet and kitchen. That is a circle of functions/spaces we require on a daily basis with or without having to go to work. Even people that work from home or in vacation go through the same steps. So shouldn’t that be the main focus? When you come home from work, you dump your clothes at the door, the shopping in the kitchen, head to the toilet, and if you can afford it, take five minutes on the couch to detach and if not go straight to cooking dinner. I’m not really sure why we tend to shove the kitchen in a corner. We make it heavy and fixed, but it is a highly valuable and mobile space. It is a meeting area with a very strong character of transition and not an end point.